A commuter rail line train. Without a passenger rail link between North and South stations, the Massachusetts Bay Transportation Authority has only one quick route through Boston when it needs to move train cars for commuters around the network. It’s called the Grand Junction Railroad, and it links the north and south tracks through a crossing over the Charles River near Boston University. The old railway is used to send out-of-commission trains from the south side of the commuter rail network to a maintenance facility near North Station; Amtrak also uses it to shift cars, while freight trains take the Grand Junction to Everett and Chelsea. But work on the Green Line extension to Somerville has forced the state to shutter the Grand Junction until at least mid-June, sending trains on a wild roundabout ride that takes them all the way through Worcester. 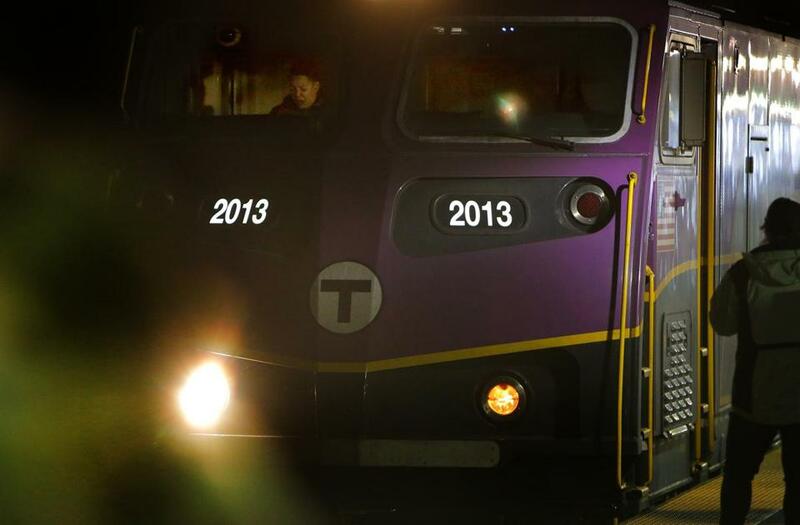 “Instead of a three-mile trip, it’s 120 miles,” said Jody Ray, the T’s assistant general manager for commuter rail. “One trip a day is basically all you can get done,” compared with as many as three a day on the Grand Junction. Trains south of Boston must now head west to Worcester, north to Ayer, and then back east on the Fitchburg Line to get toward the northern side of the rail network. Not only does it take longer, but the T must also plan trips around commuter and freight schedules on the various lines. MBTA spokesman Joe Pesaturo said the system works reasonably well, and also requires that the T do more intense maintenance work at rail yards on the southern side to minimize shuffling trains around. The T last had to utilize this roundabout route for repairs for a few weeks in 2012. During the current shutdown, officials plan to also realign the Grand Junction tracks and complete utility work nearby. The Grand Junction has factored into the hot debate over the state’s big project to straighten the Massachusetts Turnpike through Allston. Neighborhood activists have argued for running the highway at ground level where it now goes on an overhead viaduct. Officials say they’ll consider the idea, but they caution that that version of the reconstruction would effectively knock the Grand Junction out of service for several years — sending trains on the long western route for a prolonged period of time. But transit advocate Ari Ofsevit, who favors the lowered highway, said the T has shown it can survive. “It’s pretty obvious the commuter rail network can operate without the Grand Junction for a period of time,” he said. Allston activists also want the state to run passenger service to North Station along the Grand Junction, connecting it with a future transit stop called West Station. Officials say the station will be designed to eventually use the Grand Junction, but there are no set plans to run service. Getting there over land continues to prove difficult, so maybe it’s now time to get to the Seaport, well, by sea. Ferries are flocking to the Boston waterfront, with several new services expected to start over the next year. While the company has not finalized dock locations, one will be in the Seaport, said Robert DeSalvio, the company’s Boston-area president. Wynn spokesman Greg John said rides will be open to the general public in addition to casino patrons and employees. So the ferry could, for instance, help commuters get from Everett to the Seaport. The company has not yet set a fare or schedule, but service would run daily, year-round. Meanwhile, a commuter ferry between the Seaport and Lovejoy Wharf near North Station is expected to launch as soon as September, providing easier passage to the Seaport for commuters from the north. The service will be operated by the Massachusetts Convention Center Authority, which has asked companies for proposals to run shuttles and is expected to make a decision soon. The service would run as a one-year pilot program but could be extended up to three more years. Much is yet to be determined, including trip frequencies, dock locations in the Seaport, and fares. Officials expect the boats to operate during the morning and evening commutes. The service will be partially funded by companies in the Seaport, allowing their employees to ride for free. The general public would also be able to buy tickets and reserve seats with an app. Finally, the Institute of Contemporary Art will soon launch a ferry from its Seaport museum to East Boston, where it’s opening a secondary campus in June. ICA spokeswoman Colette Randall said passengers will need either a ticket or ICA membership to board.